A contractor once told me that it was almost as expensive to PAINT CABINETS as it was to buy inexpensive new cabinets! WHATTTT! I thought that was crazy. But sure enough, I had more than one person confirm this statement so I thought it had to be true. 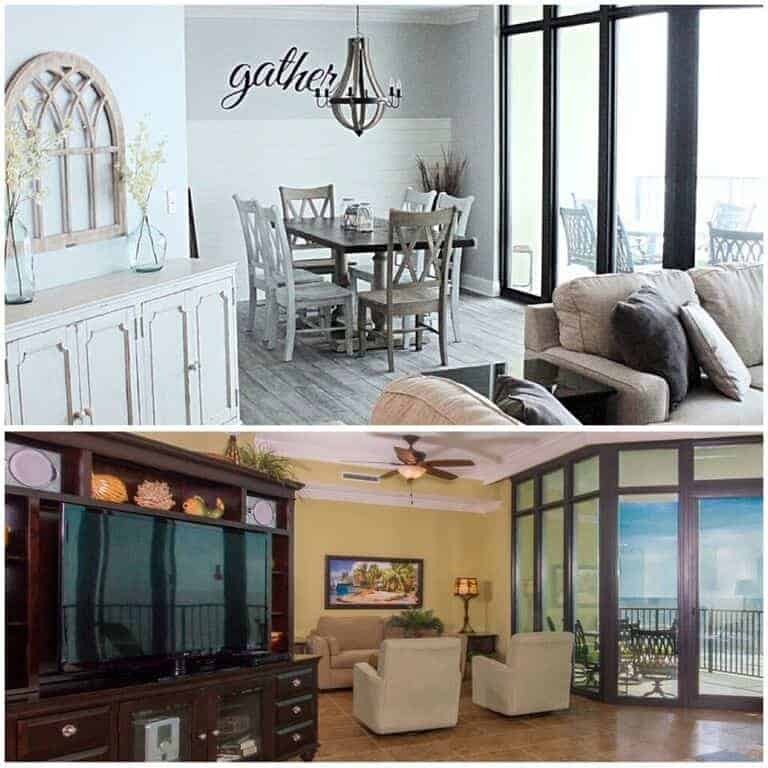 Actually, it can be very expensive to have someone paint cabinets. That’s why I decided to tackle this project myself. So how do you Paint Laminate Cabinets with NO prep work? 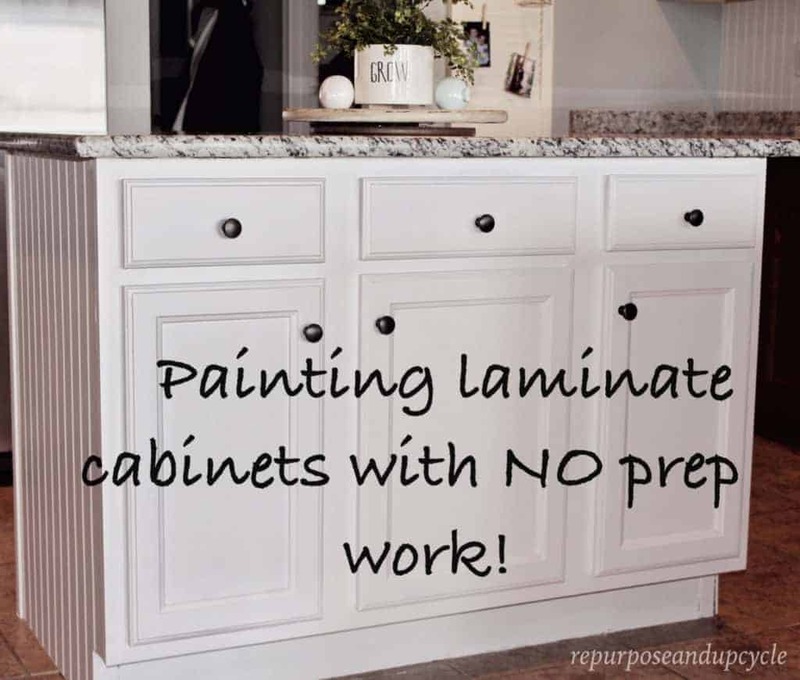 I’ll show you how I PAINTED MY cheap laminate CABINETS with virtually no prep work! 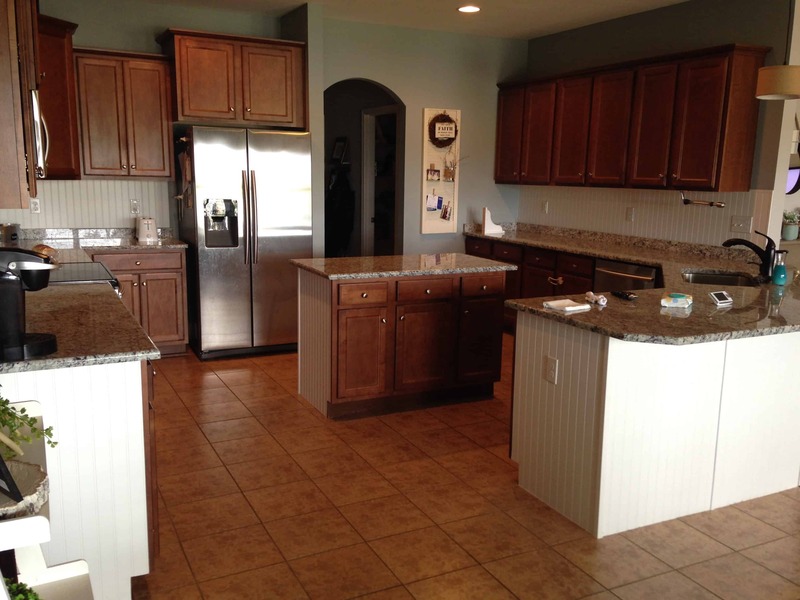 Here is what the Island cabinets looked like before I painted them. After a bit of research and debate, I decided to go with The General Finishes Milk Paint (No, this is not a paid post, just my opinions). Note: any product that is highlighted has a direct link to the product I used. This is an affiliate link and if you purchase from this link I will make a small commission, but it will in no way affect the price you pay. 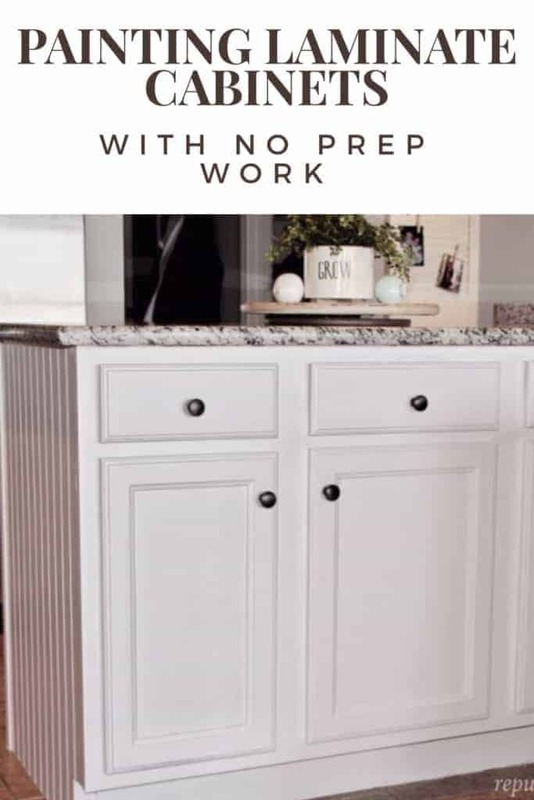 Before I get into the details on how I painted my laminate cabinets with this technique, I wanted to let you know I’ve since painted the rest of the cabinets with another technique and you can see this post HERE. Spoiler alert, I did not use primer for the other cabinets and they have not held up as well as the painted laminate cabinets in this post. I have written a full review of both of my techniques. It would a good idea to refer to this post about the review if you are getting ready to dive in head first to painting your cabinets. First things first- remove the hardware. Please don’t hate me, but my laziness got the best of me and I did do something I regret; I did not remove the cabinets before painting. I DID tape off the hardware and the areas inside the cabinets with blue painters tape, but I decided to save my self the hassle and left the cabinets on the hinges. I do regret this, because I have a lot of paint on the hardware, which you can’t see unless you open the cabinets, but nevertheless, it still looks a little “unprofessional” when you see the paint on the hardware. For my first paint job, though, I still think it still turned out pretty darn good. When you paint cheap, LAMINATE CABINETS, you need a very good primer. Since laminate is a cheap surface that is often very slick and smooth, you need a product that will really “grip” and adhere to the cabinets. 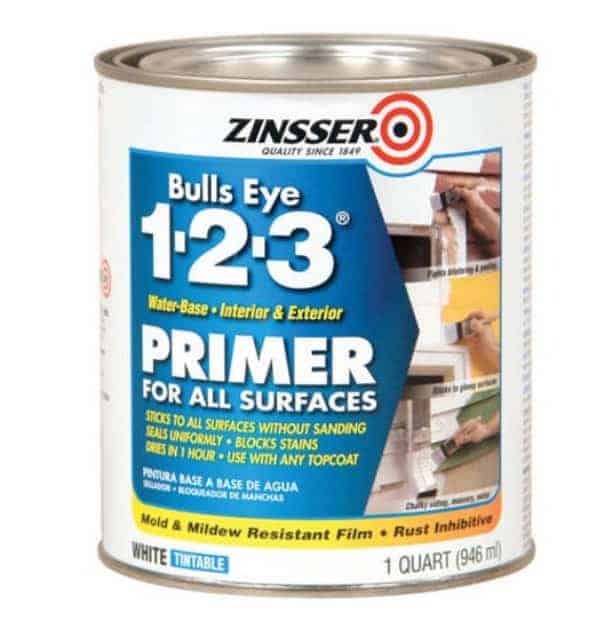 After reading lots of reviews, I decided to buy the Zinsser Primer, which covers all surfaces without the need of sanding. Im sure there are other good primers that would work too, I just decided on this one. 3. Before you prime the laminate cabinets, wipe them really good with a washcloth to remove any dirt or grime (especially any stains or anything you can’t see). If your cabinets are older and you know there is a lot of dirt that a good wipe down won’t remove, you need to use a “degreaser” to make sure the surface is completely clean. I did not use a degreaser because I quickly learned that the space around the actual cabinets was not laminate, but a wood looking sticker. I worried that if I used the degreaser, it would eat through the sticker. Talk about cheap! 4. After wiping down the cabinets and making sure they are totally dry, apply one coat of Primer. I used a fairly good quality brush for the primer. For the actual paint, I decided to go with a good quality foam brush to minimize brush strokes. This worked very well. Here is a pic of the cabinets with only one coat of primer. Because the cabinets are so cheap, and the finish is a wee bit shiny, I realized it was going to take quite two coats of primer and paint. 5. Apply second coat of Primer. 6. Now to the paint!- This picture was taken after the first coat. I used a foam brush for this part to eliminate brush strokes and still decided to use three coats! I know, it seems like a lot, but these are my kitchen cabinets and I wanted them to look fabulous with no brush strokes. 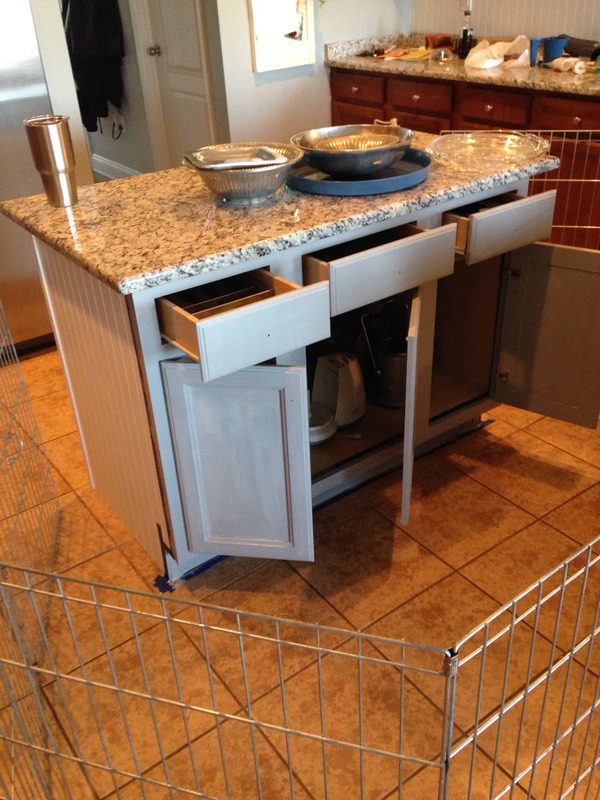 Oh, and sorry about the “cage” around the cabinets; I have a one year old, and this was my attempt to keep her away from the wet paint. Trying to get anything done with toddlers is so impossible, can anybody relate? 7. The next step in my opinion is the most important. 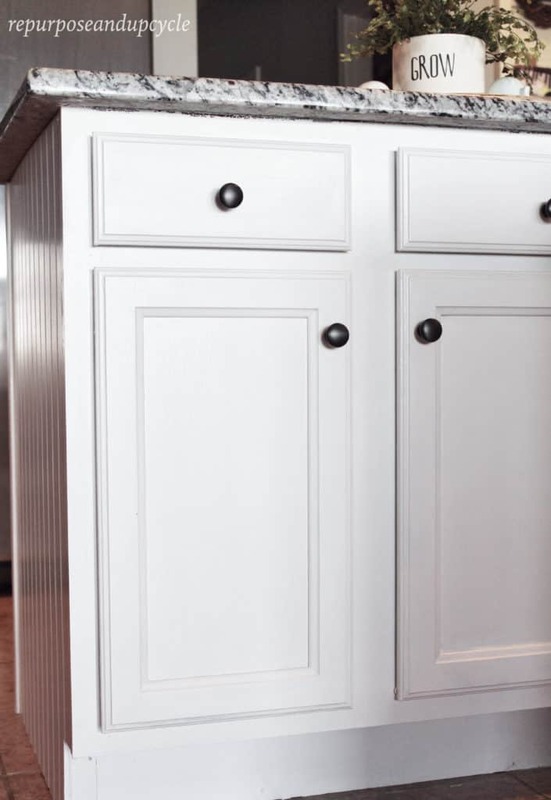 For any surface that receives a lot of use, you absolutely must use a top coat when painting laminate cabinets. Because I used the General Finishes Milk Paint, I decided to also used their High Performance water based satin top coat. I applied two coats and I have been so pleased with how durable it has made my cabinets! Side note about the top coat. A lot of top coats, like polyurethane, will create a yellow look. This is one of the only top coats I have found that will keep the color exactly as it looks before you paint it with the top coat. Note: you could probably get away with 1 coat of primer, 2 coats of paint, and 1 top coat and it will look great and last forever. However, I have two small kids and my kitchen Island gets A LOT of traffic, so I wanted to make sure the paint held up well. That’s it! I think it turned out great for my first try at PAINTING LAMINATE CABINETS. I’m so pleased with the results of my painted kitchen cabinets. I promise that anyone can transform a drab kitchen with just a few coats of paint. You don’t have to be a pro painter to complete this project, and I guarantee you won’t regret it! Seriously, if I can make a cheap veneer sticker look good with just a few coats, anyone can transform their cheap laminate cabinets. If you want to see more painting furniture posts like this one head over HERE to see my blog series all about painting and refinishing furniture 101. How I painted my cheap laminate cabinets with NO prep work! 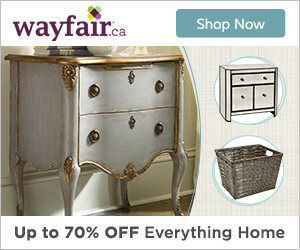 If you want to see more simple and easy home projects like this, click HERE. If you want to see my entire kitchen update for less than $4 K click HERE. Lindsey, they turned out great! I bet that you\’re going to end up having a lot of requests from people to do theirs for them! We have blonde wood cabinets and have debated painting them white. We are just nervous about how they would turn out, so this is really helpful! Going to pin and show it to Bobby! Great! Yes it took a lot of coats but well worth it. Lindsey, you did such a great job refinishing your cabinets and written such a wonderful how to, I really would live to invite you to share some projects over at Fridays Furniture Fix on Unique Junktique, hope to see you there! Thanks Brenda! I’m going to look at your site now. How long between coats did you leave it dry? Did this project take several hours or days? Hi! this project took me a little longer than it would have taken most people because I had to paint around my kids naptime and bedtime. I painted coats twice a day; around 1 PM (naptime) and 8 PM (bedtime). I would wait atleast a few hours between coats. I can’t remember what the paint’s suggested dry time is. Due to drying time, this project will take you a few days. Hope this helps! Great post!!! They look GREAT!!! How long between coats did you leave it dry? Did this project take several hours or days? Trying to get an email to your comment. Sorry! Would appreciate the dry time and time your project took to complete. Thanks!! The links aren’t working for me. So you didn’t have to use oil based laminate paint? how long has it been since you did the update to the kitchen cabinets? how’s the paint holding up now? can you post an update to this amazing DIY project? Thanks in advance! Funny you ask that, because in the next few weeks I plan to do a post on my review of my painted cabinets. My advice; USE PRIMER and at least a few coats of the top coat. I wanted to know did you paint the laminate looking sticker on the side of the cabinets ir did you use something else to replace it? I sure did paint it! As a matter of fact, I didn’t know it was a sticker until after I painted that part of the cabiets. WHen I was pulling the blue tape off (after it had been painted) it started to pull sticker off too- I was shocked. So lesson learned, always take an exacto knife or something similar and score between the cabinet and the wall, and then remove the blue tape. Painting the “laminate sticker” definitely took the most coats because it did not want to adhere. Make sure you prime it, maybe even twice before you paint it. Hope this helps! Hi! Thanks for this informative post. We just bought a house and I am about to tackle painting laminate kitchen cabinets. The previous owner has already painted the bottom this very dark brown. Would this same method work over already painted cabinets? As long as the paint they used isn’t peeling, I think you should be ok to paint right over it! Make sure to prime first (esp if you are painting a lighter color over a darker one). Good luck and I hope my post helped! It’s called snow white! Here is a link to it! Hi Lindsey, thank you for this article, was directed from the part 2 of this article to this. I think this is the reason why most people says to use primer when painting cabinets as it helps them hold up well vs when it’s not used. But I think the results in both cases are well worth it. Would you still use this technique later on after getting this result? Would be great to know. absalutely! I scrub my kitchen island daily with a clorox wipe due to the fact that my kids are in and out of this drawer a lot (messy hands). I painted that island almost 2 years ago and the paint is still holding strong with NO CHIPPING whatsovever. I hope this helps and good luck!